Still in its infancy, this is DreamWeek’s second attempt, and if the goals of The Mighty Group’s president Shokare Nakpodia—or “Sho” as he’s called—go according to plan, it will be a San Antonio staple event for decades to come. But let’s backtrack a bit: How did the idea come to fruition and what are SAers supposed to gain from going? A native of Nigeria, Nakpodia left Africa in his teens to study in London before heading to New York for an education in the visual arts. He eventually settled in San Antonio to form his local marketing group, which specializes in messages laced with community empowerment. During a meeting called by Mayor Castro a few years ago, Nakpodia and eight others representing various groups around town were tasked with expanding the image of SA beyond just the River Walk or the Alamo. While he was overlooked for the MLK March assignment, instead assigned to focus on the military, Nakpodia’s interest was piqued. Still ruminating on ways to further promote the leader’s legacy, a year later his non-profit won a contract to beautify MLK March Day graphics—and that’s when Nakpodia got the ball rolling. “I thought, how can we advance the voice by presenting all the different parties and issues and get everyone to come together and resolve these conflicts?” Nakpodia tells the Current at the Mighty Group headquarters on East Commerce Street during an interview a day shy of the summit’s kick-off event. The DreamWeek lineup includes speaker Dr. Michael Eric Dyson, author of April 4, 1968: Martin Luther King Jr.’s Death and How it Changed America, a screening of Freedom Riders and subsequent discussion with four of the original participants, an MLK oratorical contest and a stream of events from thought-provoking to whimsical. The co-host considers last year’s inaugural DreamWeek a success. While the group tapped organizations (local universities, restaurants and art museums) to participate during its first go-around, preparing for the 2014 event was noticeably more fluid: This time, organizations solicited them. If the trend continues, Nakpodia hopes to multiply the number of events and, eventually, take DreamWeek national—and even global one day, he muses aloud. If the summit gains enough momentum and expands to meet Nakpodia’s vision, one aspect will certainly remain the same: Each event must encourage tolerance, equality and diversity. “Diversity is not how many people of different cultures are existing in one place, diversity is how many people of different cultures have access to other people’s cultures and celebrate it,” says Nakpodia. Amid DreamWeek’s feel-good call for equality and tolerance, local African-American rights leaders remind us there’s still a long and rugged road ahead for black progress. SA educator and writer Fred Williams argues one of the major problems impeding black progress comes from within communities and from the generational psychological damage inflicted upon black youth. “These kids are very pessimistic about life; they are seeing they don’t have options so they end up in prison or worse. How do we change that around? That’s our big dilemma,” he says. The San Antonio College professor and author of African American-based literature feels particularly nostalgic about MLK Day. While working for former Indiana Democrat Sen. Birch Bayh years ago, Williams helped coordinate a hearing to promote the federal holiday, initiated after a request made by Coretta Scott King (widow of the late leader) to get legislation introduced on the Senate side. “I feel really close to the holiday,” says Williams. “MLK changed the whole face of America. Just 30 years ago, I couldn’t walk into a classroom and teach. Today my students don’t think, ‘here’s a black instructor’—they ask ‘how hard is this teacher going to be?’” he says. “The more things change, the more they remain the same,” says Hill. Comparing it to a contemporary version of a poll tax, Hill says voter ID laws fall “under the guise of voter integrity,” but are truly meant to prevent minorities, especially African-Americans, from voting. Locally, Hill hears several complaints of police brutality, intimidation and school bullying based on race. He also says there’s been a mass exodus of educated African-Americans from San Antonio, fleeing to find better job opportunities. “Our young folk that are going to college don’t come back because there is no reason to return—they can’t get hired. We need more homegrown African-Americans in employment and leadership positions,” says Hill. 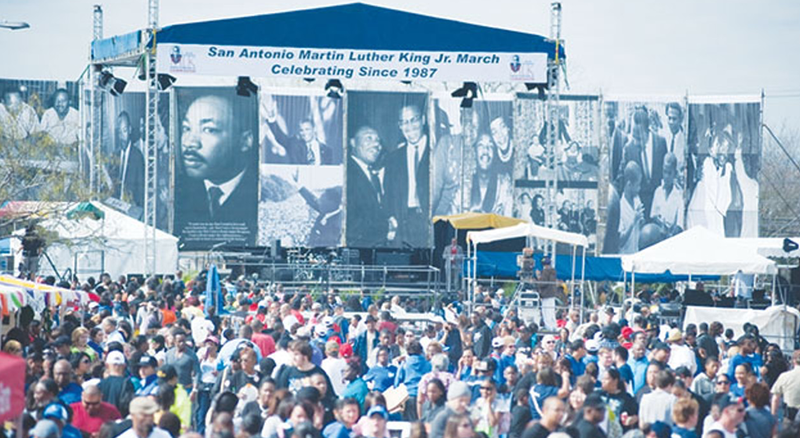 While on his search to answer why SA holds the nation’s largest MLK March, attracting an estimated 100,000 people, Nakpodia discovered the city’s reputation for peaceful resolution—perhaps signaling hope that the problems for minority communities may not vanish any time soon but that, at the least, thoughtful dialogue on progress and reconciling differences may emerge—the very point of the MLK Jr.-inspired conference. “I learned that we tend to resolve our conflicts with less drama and more tolerance than most other cities of our size,” Nakpodia said. DreamWeek runs from January 10-21; a full schedule of events can be found at dreamweek.org.